I think your whole family will really enjoy this easy to make tasty dish. This recipe is just too simple to be so good! Bake in a 450 oven for 15 minutes or until browned. 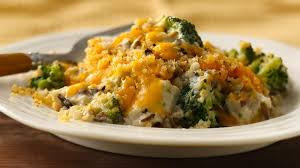 In a shallow 8x8 casserole, arrange broccoli. Top with chicken strips. Blend soup.and milk; pour over chicken. Sprinkle with cheese.